Hello my friends. Just a quick post today. I am taking a two week course called Kick Start that is being presented by Kristina Werner and Jennifer McGuire and this is the first card I have made while attending. Hope you all are having a really crafty day. 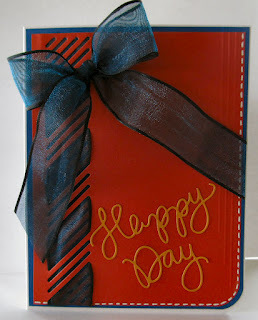 I absolutely love the way you ran your ribbon through the diagonal cuts on the side of your card. So cool! Thanks for sharing with the class your lovely creation. Hi Penny, love how you made the ribbon! I´m taking the course also, hope you are enjoying it as much as I do :-) have a nice day! This card is lovely, completely balanced. Love the diecut. Wonderful weaving of the ribbon through the die cut!